Summertime is the perfect time for grilling, and this easy grilled chicken recipe is one of my favorites. Made with Tyson® All Natural Chicken Tenderloins, my favorite grilled chicken seasoning, and fresh vegetables. It’s the perfect way to welcome summer! Your summer get-togethers will be a breeze when you grab some Tyson® Chicken Tenderloins along with your favorite vegetables and seasonings at your local Target store. I love to crank up the grill, and Target makes it easy with their well thought out layout. I am able to get in and out in just a few minutes. I am a HUGE fan of grilling. We love to crank up our grill all year round, but the summertime has us grilling full steam ahead. With our extra large ceramic grill, we can cook enough for the week if we plan out meals. 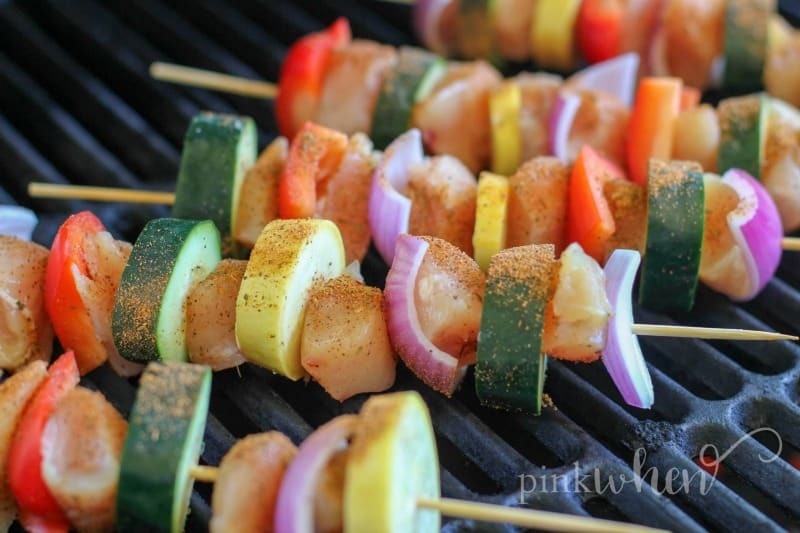 One of our favorite ways to grill is by making Chicken and Vegetable Skewers. You get all of your favorite seasonings and foods cooked easily. What do I need for grilled chicken skewers? 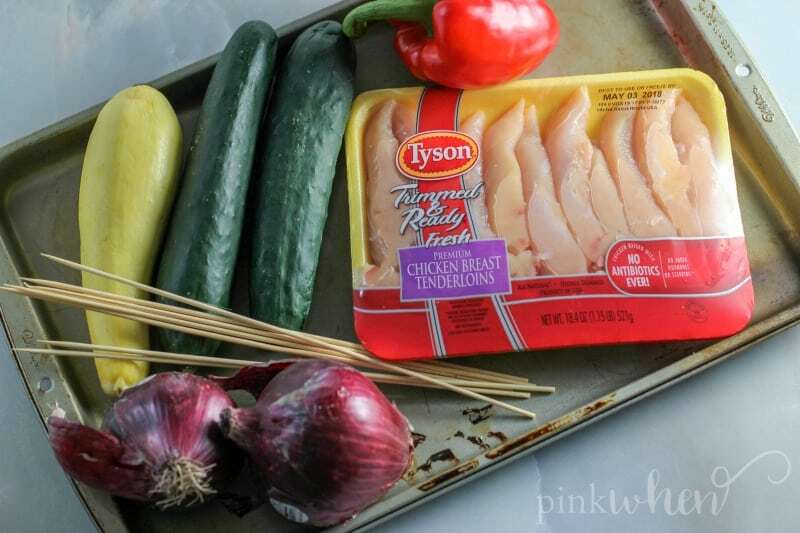 If you are planning on making these Chicken and Vegetable Skewers, grab your favorite vegetables, seasonings, skewers, and these Tyson all natural chicken tenderloins from Target. 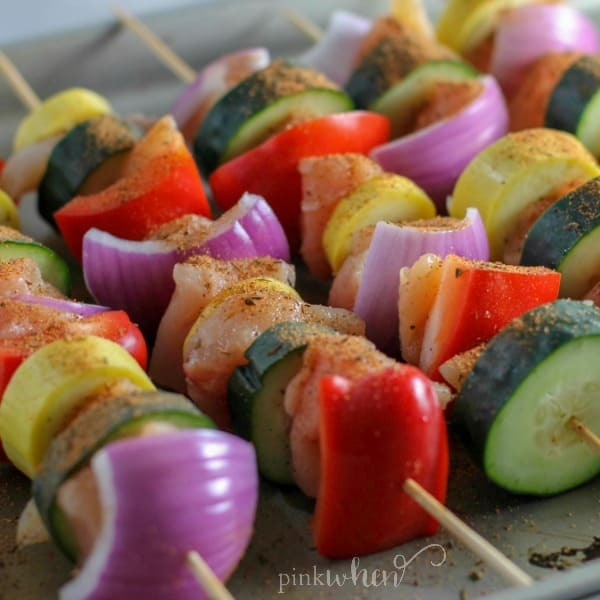 I always change my vegetables up, but for these skewers I used bell pepper, onion, squash, and cucumber. The sky is the limit with all of the amazing variations you can make with this recipe. To get started, you will want to chop up all of the vegetables into pieces that are all about the same size. This will help cook everything more evenly while on the grill. Next I take my prepackaged trimmed chicken tenderloins (thanks Tyson Foods, Inc.) and cut them into bite sized pieces. The perfect part about making this easy grilled chicken recipe is that you are technically already making your side dishes, too! I love that I am getting my grilled vegetables and chicken all done in one quick grilling session. 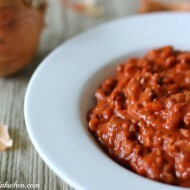 Another bonus with this easy recipe? 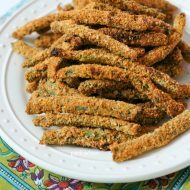 Because everything is cut up into bite sized pieces, you don’t have to grill these for long at all. 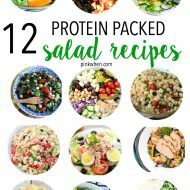 Also, because you are using skewers to cook everything, you are using less dishes and essentially making this the easiest recipe for cleanup and cooking. That means you get back to enjoying your family and friends and your summer. 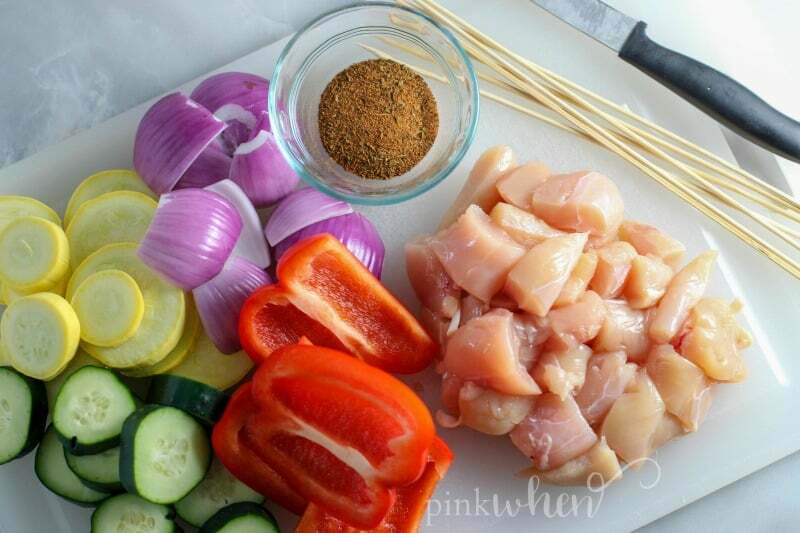 Once I have all of my chicken and vegetables cut and ready to go I can start to make my skewers. I love to rotate the vegetables a little to give different color variations on the ends. 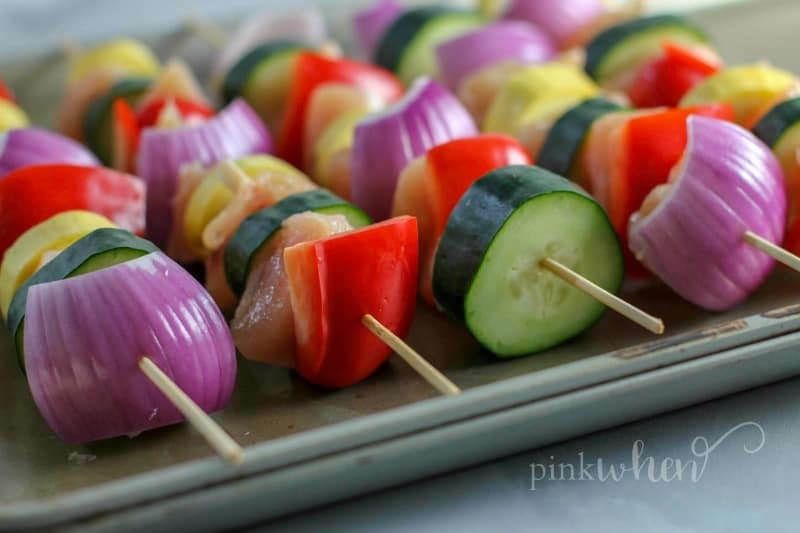 If you have any leftover vegetables, make those into vegetable skewers. I always love to use up all of my vegetables and make sure we grill any extras. The next step is to rotate and season all sides of the skewers before you place them onto the grill. How long should I cook chicken skewers? Now this is a little tricky question, but the correct answer is always “until they are done!” Ha. But seriously, we use a ceramic grill so we can easily and consistently get our grill to be 350 degrees. Once we hit that temp, we place our skewers on the grill and allow them to fully cook, generally around 20 minutes with several rotations during this time. The key is to make sure your grill stays at temperature and you rotate the skewers every 5 minutes or so. The safe internal temperature for cooked chicken is 165 degrees Fahrenheit. Once they are fully cooked, pull and serve! Looking for more grilled chicken recipe ideas? Savor summer celebrations in every bite with Tyson® fresh chicken recipes such as these Yummy Honey Chicken Kabobs,which you can fins when you check out this Summer Field Guide. Big or small, Target and Tyson Fresh Chicken will make your backyard event easy. 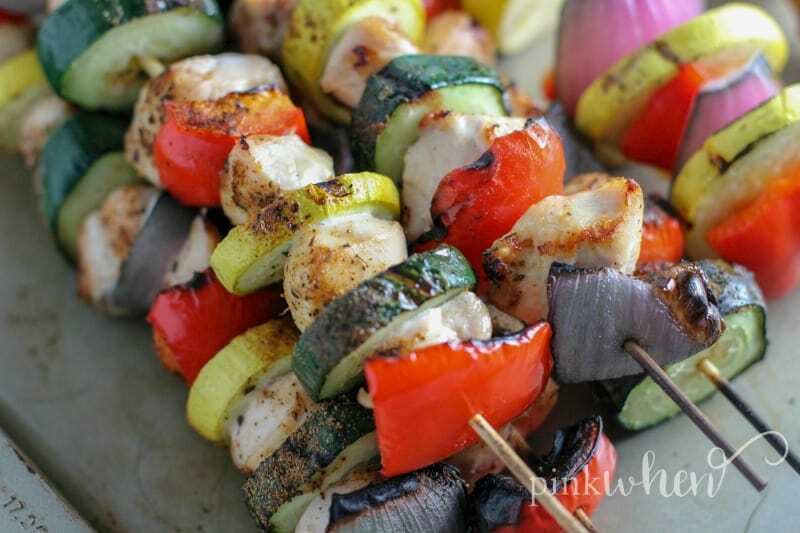 A perfect summer kabob, this easy grilled chicken recipe is quick and delicious! Cut the chicken tenderloins into bite sized pieces. Cut the vegetables up into bite sized pieces, all about the same size. Take your skewers and place vegetable, chicken, vegetable, chicken, and continue to rotate that sequence until the skewer is full. 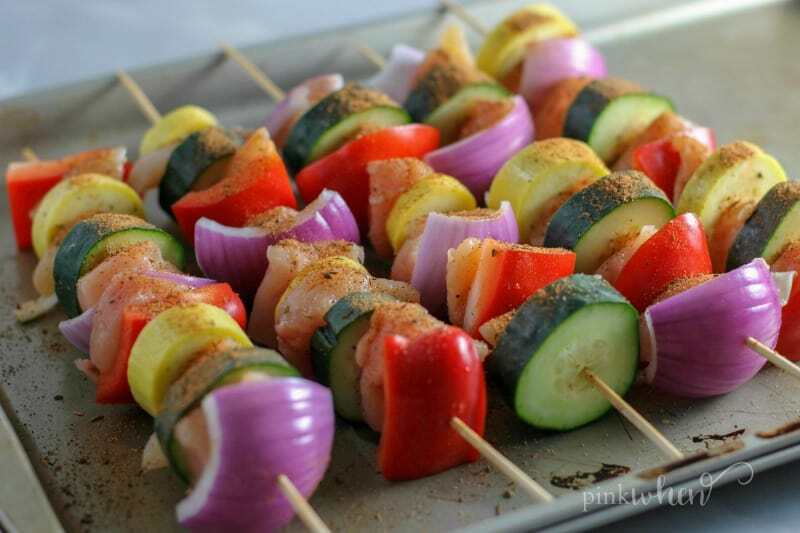 Sprinkle you favorite seasonings onto the skewers. Heat the grill to 350 degrees. Place skewers onto the grill and cook with lid closed for 20 minutes, rotating the skewers every five minutes until done. Thank you! It’s so good 🙂 One of our favorite grilled recipes.